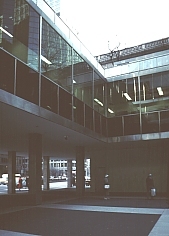 Images of Lever House, New York City, by Skidmore, Owings and Merrill (Gordon Bunshaft), 1950-52. Digital Imaging Project: Art historical images of European and North American architecture and sculpture from classical Greek to Post-modern. Scanned from slides taken on site by Mary Ann Sullivan, Bluffton College. 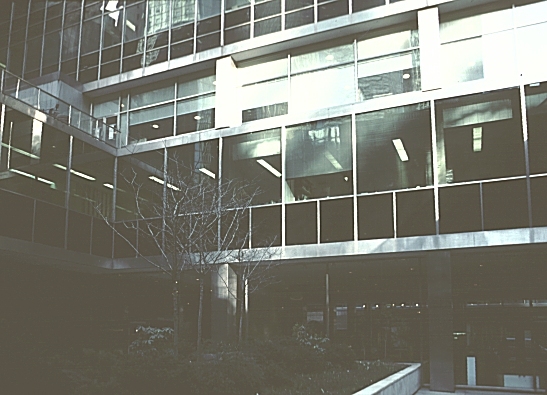 Considered a "classic" SOM building, Lever House opens up the urban space with a central plaza and is set back from the street. 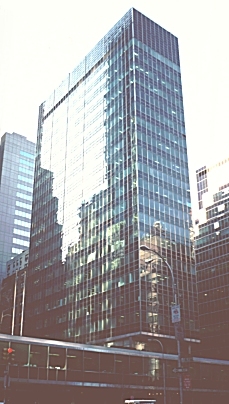 This 21-story building has transparent green glass with blue-grey spandrels. A mezzanine, supported on pilotis, surrounds the open central court. Other buildings on this site by SOM include: Alcoa Building, Beinecke Rare Book Library, Yale, Columbus City Hall, Crown Zellerbach Building, Richard Daley Center, Davies Symphony Hall, Fort Wayne Museum of Art, Galvin Library, Illinois Institute of Technology, Hastings College of Law, John Hancock Tower, Hirshhorn Museum, Olivetti (formerly Pepsi Cola) Building, The Republic (Newspaper) Building, and the Sears Tower.